CM Magazine:Canadian Citizenship in Action Series. Calgary, AB: Weigl, (Distributed by Saunders Book Company), 2009. 32 pp., pbk. & hc., $11.95 (pbk. ), $23.95 (hc.). ISBN 978-1-55388-465-1 (pbk. ), ISBN 978-1-55388-464-4 (hc.). ISBN 978-1-55388-467-5 (pbk. ), ISBN 978-1-55388-466-8 (hc.). Citizens and Government in Canada. Calgary, AB: Weigl, (Distributed by Saunders Book Company), 2009. 32 pp., pbk. & hc., $11.95 (pbk. ), $23.95 (hc.). ISBN 978-1-55388-469-9 (pbk. ), ISBN 978-1-55388-468-2 (hc.). ISBN 978-1-55388-471-2 (pbk. ), ISBN 978-1-55388-470-5 (hc.). 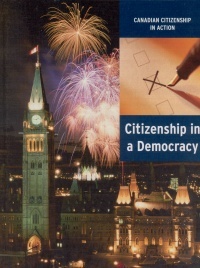 Canadian Citizenship in Action is a series of four books intended to help students understand just what living in a democracy like ours means, and how each person can participate, as well as what barriers may be encountered. The individual volumes have several points in common: each is 32 pages in length and lavishly illustrated; each includes an index, glossary, and bibliographical references to both books and websites; each finishes with a collection of four viewpoints , statements paired with an unidentified but appropriate portrait, which give polarized opinions that the content of the book should enable readers to assess and evaluate. Slightly modified, these statements would make good debating topics. What Is Citizenship? 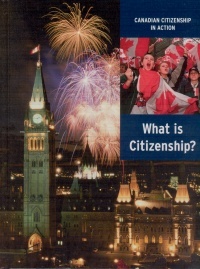 begins by defining citizenship as being "based on participation" and goes on to show, by means of such exemplars as Michael Jean and Craig Kielburger, how one can make a difference to life in Canada and in the world. Varying levels of participation in government from merely casting one's ballot to being an MP or MLA are examined. Parallels are drawn between our federal parliament and the organization of a student council, bringing concepts closer to home for young readers. Citizenship in a Democracy gives some history of the development of democratic ideas, starting with the ancient Greek model of direct democracy where every citizen could have his say, and then showing how our government actually incorporates as well a good deal of the Iroquois system of representative democracy in a federation of member states. Not all democracies are political--think, for example, of sports teams or book clubs--and almost any organization needs some sort of structure. Many decisions are taken by the vote of the majority, i.e., democratically. "The hockey coach as dictator", however, was not a topic that was discussed! Opportunities for youth participation through page programmes in provincial or federal legislatures, and the largely on-line Youth Parliament are explained in some detail. There is an interesting presentation of two possible positions of elected representatives on a question about to be put to the vote: should the representative vote as her constituents would wish, or as her political party has decreed? Again, a good debating topic. 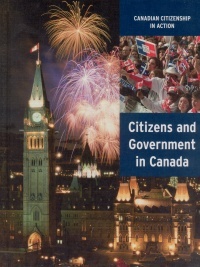 Citizens and Government in Canada begins with the definition of a constitution and the history of the British North America Act, the Constitution Act, 1982, and the Charter of Rights. It then continues with the Meech Lake Accord, Elijah Harper, and the Charlottetown Accord, all of which being necessary background to any understanding of how our government works, or doesn't. 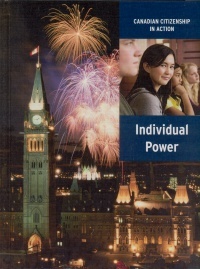 While the book states the BNA Act granted Parliament the power to make laws for peace, order, and good government in Canada in relation to all matters "not coming within the classes of subjects by this Act assigned exclusively to the Legislatures of the Provinces," some concrete examples would have been helpful for purposes of clarification. I also missed having no discussion of powers of taxation with relation to division of responsibilities. Municipalities, for example, are in charge of things that impact directly on everyone's lives, and yet they have a very limited taxation base and have to rely on handouts from higher levels of government. Is this right, or should it be changed? Individual Power is devoted mostly to an expansion of the statement in the introduction that "an individual's empowerment is affected by socio-economic factors, cultural factors, geographical factors, and demographic factors", explaining what is meant by each term, and giving examples. It does point out that the Quebec-Windsor corridor has 2% of Canada's land area and 60% of its population, but then says that "with representation by population, there is little concern about being forgotten in the House of Commons," but it does not point out that one vote in these smaller, but very populous, ridings is worth a great deal less than one in Nunavut, for example, with its total of 50,000 people. Emphasis is rightly put on education--or the lack thereof--as being an obvious necessity for real citizenship. How can one keep oneself informed if one belongs to the 15% of Canadians who are functionally illiterate? I liked this series very much. The books are well written--careful reading found only one real copyediting error--although some of the glossary definitions could have been better worded. The books relate large-scale issues to ones that are within the reader's experience, and they certainly make one think. Any classroom from grade 4 to 8 could have its curriculum significantly enriched by having these books as a resource. Mary Thomas lives and works in Winnipeg, MB.